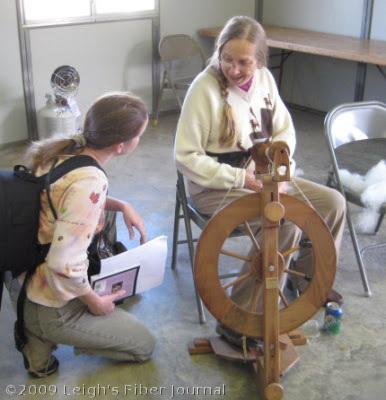 For the past several years my guild has been doing a Sheep To Shawl at SAFF (Southeastern Animal Fiber Fair) at the WNC Ag Center in Asheville, NC. This year I was able to participate. We had a great location and gorgeous autumn weather. 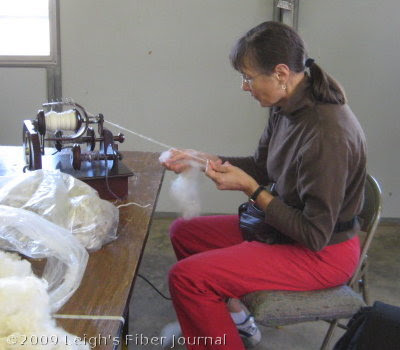 Since this is a local event, most of our active guild members were volunteering in other aspects of the Fiber Fair, but we had four spinners and a weaver to demonstrate the process. We started with a donated, washed Border Leicester Fleece. Charlene, who coordinated the event, did the drum carding. A lot of folks were interested in the entire process. 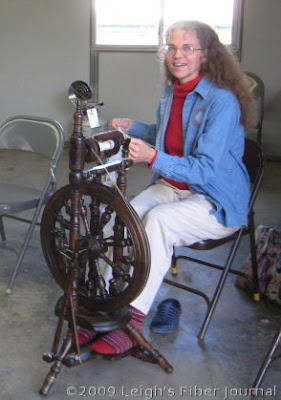 This is Barbara, demonstrating spinning and answering questions. Rats, but if someone didn't volunteer to take my picture too. Note that I'm wearing my Fiber Forum socks. Teena demonstrated on her electric spinner. The warp was a combination of 2-ply handspun and commercial wool yarn. There was a little alpaca thrown in as well. The singles we spun that day were used for the weft. The plan for the shawl is to raffle it with proceeds going toward the Blue Ridge Fiber Show. In the afternoon, we had a shearing demonstration. This is Elspeth, a rescue sheep. 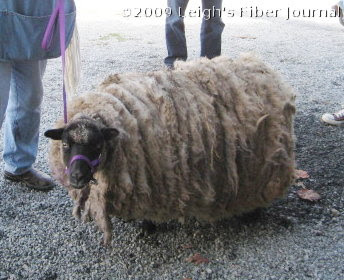 She is a registered Shetland, who other than not having been sheared for at least two years, was healthy. Paula, who owns Shetlands, did the shearing. 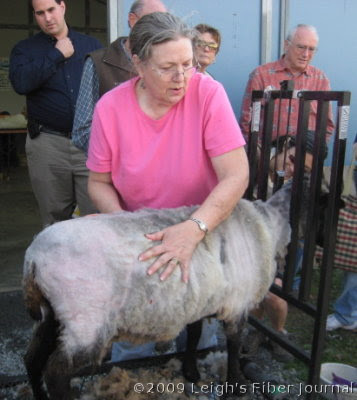 She used a shearing stand and started at the tail. 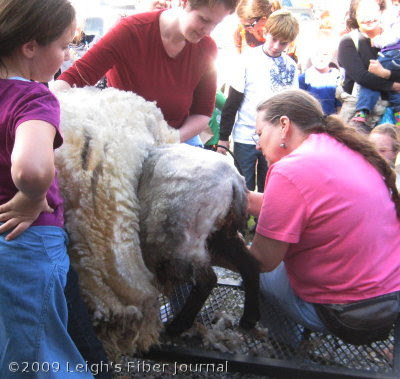 As she sheared her way to the front, Elspeth's fleece was rolled up toward her head. Elspeth got a massage after her ordeal. She wasn't too happy about being there, but calmed down considerably as the shearing progressed. 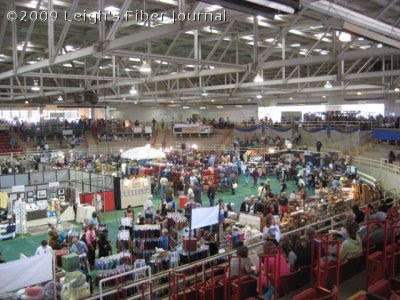 And the rest of the Fiber Fair? It was bigger, better, and busier than ever, with more vendors, more classes, and more folks coming to look, buy, learn, and see. 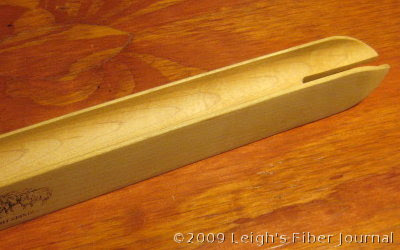 Just this, a 20.5 inch Schacht rag shuttle for the rag rug I plan to weave for our bedroom. I didn't stay till the end because I had a pretty good drive home. It just felt good to get my wheel out and spin again. Hopefully this winter I can resume spinning as a daily activity. By the fire. Sounds good, doesn't it? I wish I could go to something like this! 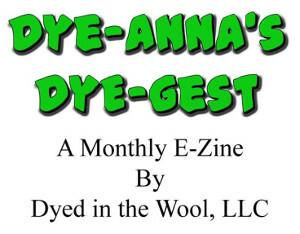 I love the photo essay of sheep to cloth! And I don't think I had seen a picture of you before - nice to see you! Nice coverage of the event for those of us who can't make it to NC this weekend!! That sheep being sheered is pretty amazing. I always have a soft spot for rescued animals. 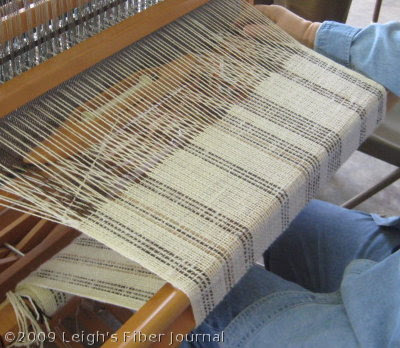 I've never demo'ed weaving at a fair or festival, but I've been thinking lately that I ought to give it a try sometime. I second the photo of you. I have never seen you? Well may have at the guild. I have gone a couple of times in the past few years. I do recognize a few of the women though. SAFF, have not gone since 2003. Shame on me. Everyone went this weekend, can't see going since I have so much stuff already, but thanks for posting the pictures it is nice to see, and kind of makes me regret not going, which is a good thing. I need to stop being a hermit. We were thinking of taking a trip to SAFF this year but got caught up in painting. Maybe next year. Pictures are great. I loved doing sheep to shawls but know that's not in the cards any more due to back problems. Looks like everyone's having so much fun. You do look right at home at your wheel. 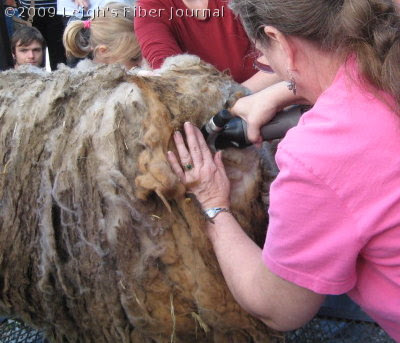 Did that overgrown Shetland fleece get weighed? Would be fun to know just how heavy it was! Thanks for including the photo of yourself; for us long-distance blogpals, it's nice to get better acquainted! What a fantastic event! 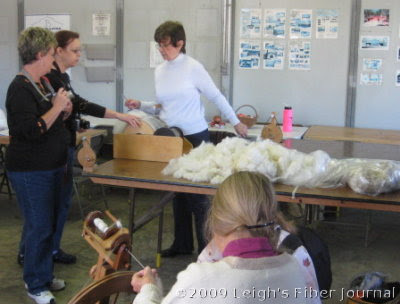 I love that you demonstrate the whole process from sheep to cloth. For most people today this is a remote and abstract process, and they have no clue how clothes or cloth are made. Lucky visitors! Nice to meet you at last! Looked like a fun day. My daughter is in central NC and wanted to come but transportation was an issue this time. Perhaps next year? She's new to spinning and having fun with it. I have resumed spinning in the evenings again and quite enjoy it. Amazing what you get done watching the TV... okay, occassionally glancing at the screen! What a fun thing to do! I bet Elspeth the sheep was much happier when her heavy coat was off! The shawl looks good on the loom. 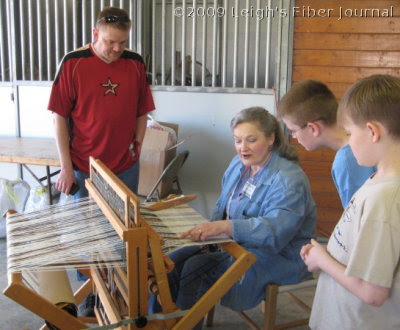 I meet so many people who don't know what weaving and spinning involve, I think this sort of event is needed, everywhere. I wonder if there's a way the Online Guild could run an event like this? Gosh darn---I was at SAFF on Saturday morning. Had I realized, I would have stopped at Sheep to Shawl. Peg! I wish I'd known. I should have said something beforehand, but I just never got around to it. Wow that looked like a great weekend, I love that you wore your socks for spinning. Spending a rainy morning reading new blogs. Just wanted to let you know I stopped by. 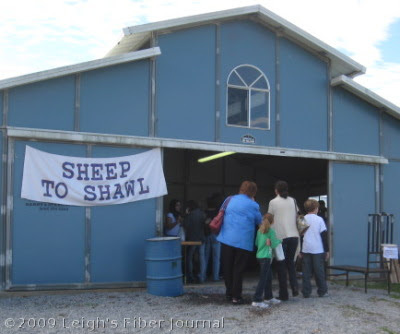 Thanks for sharing the "Sheep to Shawl" event. Makes me wish I could have been there. WONDERFUL post Leigh! I so enjoyed it since it is an event I probably won't ever get too. Nice to see you in there too. 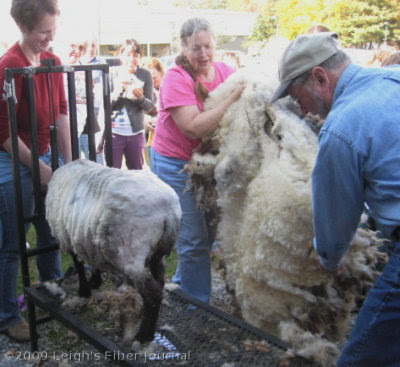 They should get a big old medal for doing the shearing demo on rescued sheep. I can only imagine how good they feel now to have two years worth of wool off of them. So, did you put dibs in for the rescued sheep to start your flock or where they spoken for? I've seen the sheep to shawl progress at the Black Sheep Gathering here in Oregon, it's an amazing thing to see the raw fiber go through all those changes in a day. Deep End, I love handknit wool socks for spinning. They feel so good on the feet. That looks like such a fun time! And boy did Elsbeth need a hair cut. And that is such a cute picture of you! I've done Sheep to Shawl just once and while intense, I'd love the chance to do it again. I was the plier in one of nine teams It was a hot day in an unairconditioned building. The weaver on another team passed out from the heat, and another team member took up the weaving while the paramedics attended their fallen comrade. It is probably a better experience when done for demo purposes. A friend of mine had a booth at SAFF (Trading Post for Fiber Arts) and she said it was her best year ever! I am so glad! One year I'd like to go, even if it is to work in her booth so I can see it all. 11 pounds of fleece. I'll bet Elspeth thought she could leap to the moon once it was removed. What a great post, Leigh! Love the photo of you in your socks at your wheel, and hooray that Elspeth was rescued and shorn! ... amazing that the fleece was in pretty good condition. Spinning by the fire, yep.